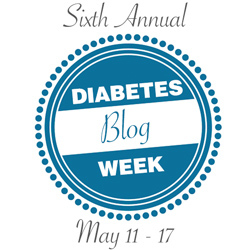 Next week I will be participating in Diabetes Blog Week sponsored by Karen. Last year I started blogging right after my daughter was diagnosed with Type 1. Yesterday we found out my husband has Type 2. Right now I don’t have anymore information as he was told over the phone and needs to go in and see his doctor but I feel like this is a whole different ball game. Oh wow, I’m so sorry to hear about your husband’s diagnosis. I learned so much from you last year, blogging as a parent of a brand-newly diagnosed child. Thank you for joining in again. Thanks Karen. Still processing it but looking forward to next week’s blogging.